On this page we have some answers to the most important questions about sous vide in general, the process and fusionchef. Our cumulative questions and the answers provide a first look at the sous vide subject. Chefs can receive feedback on their very specific questions regarding their professional kitchens. If any questions should remain unanswered, please contact us and state your question. Can foods with different cooking temperatures be cooked in a sous vide cooker at the same time? We recommend using several fusionchef units when simultaniously working with different cooking temperatures and cooking various foods (e.g. meat, fish, vegetables). With the help of multiple fusionchef units, different temperatures can be controlled and a complete menu can be developed at the same time. Another option is to use the core temperature sensor for the Diamond. The Diamond sous vide thermostat can be set to heat the water to the highest temperature needed for the first food, meanwhile another food requiring a lower temperature can be controlled by the core temperature sensor. When the desired core temperature of the second food is reached, immediately remove it from the sous vide water bath. It is ready. Can I serve the food used with the fusionchef core temperature sensor? If the core temperature sensor is used in conjunction with the special fusionchef adhesive sealing tape, then the puncture point in the vacuum bag is sealed and the vacuum will be maintained. It cannot be completely ruled out that water from the water bath does not come into contact with the food. Does a fusionchef sous vide cooker need to be serviced? 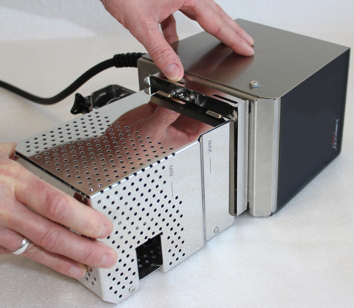 fusionchef instruments are constructed for continuous use under normal circumstances. It is not necessary to service the units on a regular basis. Does the fusionchef sous vide cooker need to be calibrated? 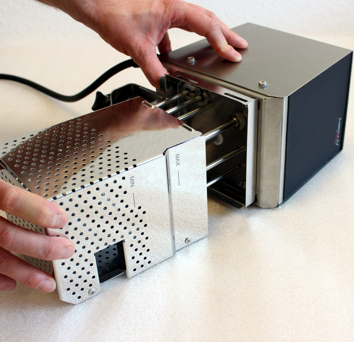 All fusionchef sous vide instruments are meticulously tested and calibrated before leaving our factory. They are designed for precise, continuous operation. It will take a long time for the instrument´s sensors to lose a very minimal amount of precision if any. Only after many years, can there be slight differences. Therefore it is not necessary to calibrate the fusionchef thermostat under normal conditions. How can the protective grid that comes with the thermostat be removed and remounted? The protective grid must be removed in order to carefully clean the functional parts (circulation pump, float, and the heater). Important: The machine must be turned off and the electrical cord must be unplugged! Do not lay the sous vide thermostat on its head - doing so will allow water to seep into the machine! Take the sous vide thermostat out of the sous vide water bath and diligently dry it. 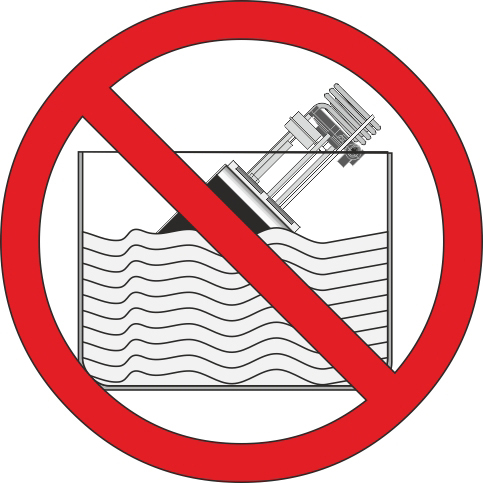 Do not allow any water to seep into the machine. Turn the sous vide thermostat on its side and lightly push the edge of the metal housing to the side. Then pull the protective grid down. After cleaning the protective grid, remount it in the reverse order. After that, check the function of the low-level safety mechanism: test if the float can easily move by using a thin pin through the opening in the protective grid. How is water in the fusionchef water bath correctly emptied? Each fusionchef sous vide model (XS, S, M. L and XL) comes with a drain valve that needs to be inserted in place of the integrated screw plug before the first use. To empty the water bath, turn off the sous vide thermostat and unplug the machine. Place the sous vide machine over a drain or place the drain valve over a large enough vessel. Open the drain valve and let the water flow out. How long does it take for a Pearl thermostat to pay for itself? The sous vide cooking method reduces cooking food shrinkage to a minimum and the Pearl will already pay for itself with the savings on food shrinkage after sous vide cooking circa 170kg of beef tenderloin. How much electricity does a fusionchef sous vide cooker consume while in continuous operation? When the set temperature is reached, a kilogram of Sauerbraten (core temperature of +3 ̊C) is placed into the sous vide water bath and is cooked at 60 ̊C for 18 hours. How much food can be cooked in the different bath sizes? In order to maintain optimal water circulation and a constant temperature inside the sous vide water bath or external cooking vessel, we recommend, as a general rule of thumb, not to cook any more than about half of the water bath volume in kg of food. How often does the fusionchef sous vide cooker need to be descaled? 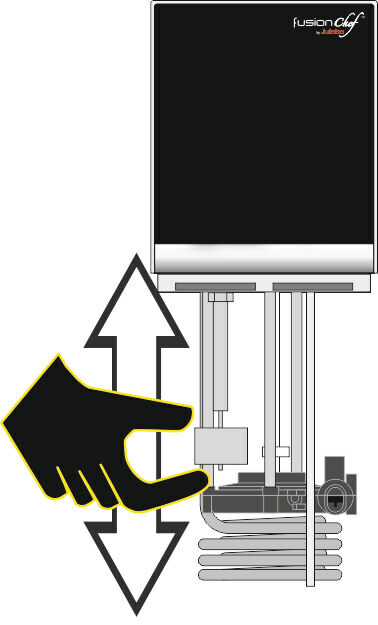 We recommend that you proactively descale your fusionchef on a regular basis before hard water deposits are visible. How often you need to descale will depend on the hardness of the water used in the machine. In order to protect your fusionchef from calcium deposits and for the safe removal of hard water deposits, we offer an effective descaler in our fusionchef line of accessories. How often does the water in the fusionchef sous vide cooker need to be changed? Only use decalcified water in a fusionchef sous vide instrument. The water should be changed on a regular basis. We recommend it be changed daily. can increase the concentration of minerals in the water from the continuous refilling, which will create a crust on the sous vide thermostat and the sous vide water bath. can result in contamination of the vacuum bags from particles in the water. Is it possible that parts of the fusionchef sous vide cooker will corrode from improper handling? Do not clean the sous vide thermostat and the sous vide water bath with steel wool. Do not add salt to the temperature regulated water. Chlorine in drinking water can cause corrosion. Iron containing drinking water can cause rust to form due to the flocculation of the iron when heated. What needs to be taken into consideration when cleaning the sous vide cooker? Always turn off and unplug the sous vide instrument before cleaning it. Be careful not to allow any water used in cleaning to seep into the machine. 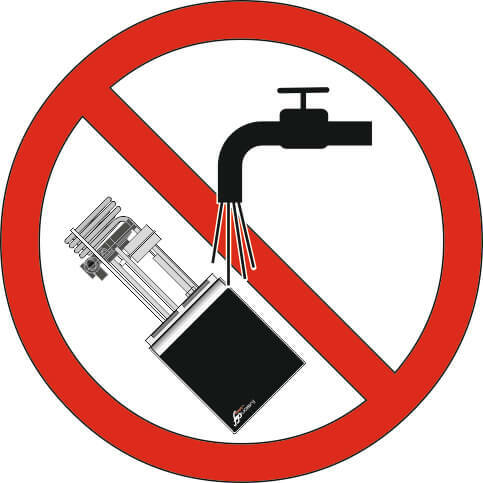 Do not clean a fusionchef sous vide machine with a jet of water or submerge it into water. Do not lay the sous vide thermostat on its head - doing so will allow water to seep into the machine. Wash the stainless steel water bath and the functional parts (circulation pump, float, and the heater) with a mild soap solution. Rinse the bath and parts with filtered water and diligently wipe all the parts dry with a soft towel. Do not lay the machine on its head! Rub down the outer sides with a towel and the mild soap solution. Finally, check the low-level safety feature. Hold the sous vide thermostat perpendicular to the countertop and test the ease of movement of the float. What preventative measures can be taken to stop the vacuum-sealed food from floating to the top of the sous vide water bath and thus cooking unevenly? fusionchef offers custom fitting retaining grids for the XS, S, M, L and XL sous vide cooker in order to hold the vacuum bags under water. The retaining grids can be placed on top of the fusionchef sous vide water bath to guarantee the food is equally heated on all sides. Why is it necessary to have a circulation pump in a sous vide instrument? Every fusionchef comes with an integrated circulation pump with a capacity of 14l/min. It is responsible for the continuous circulation of water in the vessel and results in a constant temperature within ± 0.01°C of the set temperature in the entire sous vide water bath or external cooking vessel.